In our long history of working with dentists, GPM has implemented just about every type of dental marketing strategy you can think of. The markets range from major metropolitans like San Francisco to small suburbs like Elbridge, NY. We wanted to take the opportunity to share with you their journey, in their own words. The Story: Dr. Highsmith met GPM’s founder Xaña Winans while she was lecturing on dental marketing related topics at LVI. He was looking for a new marketing agency that understood dentistry. Together they tested a number of strategies, but ultimately found the strongest results with television. The efficiency of the television investment was improved further by testing networks and making adjustments to the ad style. In 2018, he has achieved a 10:1 ROI with his television advertising attracting over 100 new patients. Print, by comparison achieved an ROI of 4:1 while active, and attracted between 5-10 patients per year. Advice for Other Dentists: “The main thing is you have to find what works in your market because all markets are different. Getting the data proves what is working and what is not. Because we measure everything, I could see that while print marketing used to work well, it just didn’t deliver for me the past few years. The Story: Dr. Peter March wished to increase new patients numbers in anticipation of his son (Dr. Edmund March) graduating dental school and joining the practice. They were doing dental marketing mostly on their own but had the foundation set with a website, signage, logo, and print materials. “Get involved in the community, whatever that looks like for your practice.” – Rebeca Swank, Marketing Director, Foster Dental Care. Every dental practice has a different path to their success. Finding the strategy that works for you may come with some trial-and-error. Whatever your marketing plans are for the coming year, we urge you to put a plan in place on how to track its success. Give each dental marketing strategy time to prove its worth before giving up and moving on to the next thing. We are inspired by the results these dental practices have found and their willingness to accept when it’s time to shift gears as an expected part of the process. 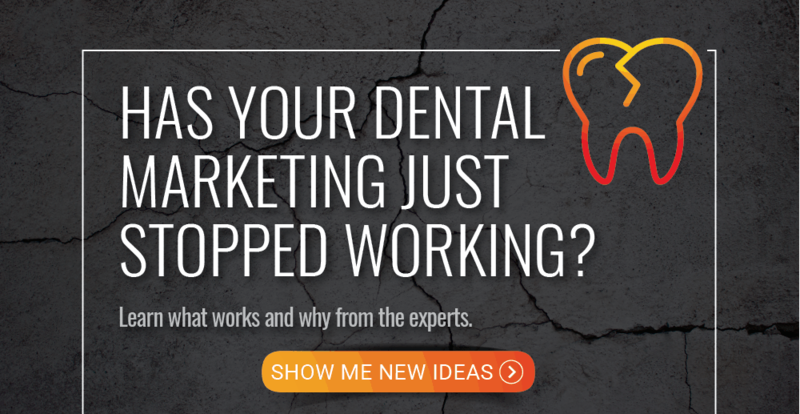 In search of more inspiration for your dental marketing? Check out our free guide. We’ve got you covered.